Newmarket, NH is a town with a population of 7157. It lies between Durham (home of the University of New Hampshire) and Exeter (home of Phillips Exeter Academy), on Great Bay. Across Great Bay is Portsmouth, the northernmost city on the New Hampshire coast. Newmarket has a small shopping district with a convenience grocery, a post office, an excellent pizza parlor (soon to move to bigger quarters), and a video rental store. The old mill (so many towns in New England have old mills) is in the center of town on the Lamprey River. Part of the mill has been converted to condominiums. 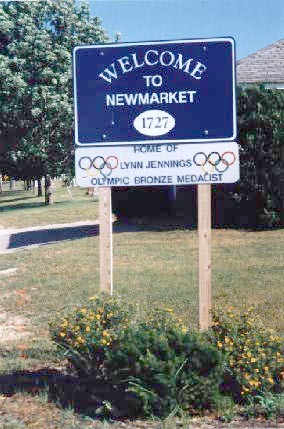 By the way, we saw Lynn Jennings running on the roads of Newmarket. The photo above is a panorama; on a display with 72 dots-per-inch, it is 36 inches wide. Scroll across your web client to see the whole width. We stayed with friends who live at Moody Point on Great Bay. It is a nature preserve. We watched the tide roll out (the mud flats were easy to see) and we listened to cormorants and loons at night. It was lovely. Last updated 2000 September 4.